-- Oh, Christmas Tree: Securely anchor your Christmas tree so it doesn't tip and fall, causing possible injury to your pet. This will also prevent the tree water--which may contain fertilizers that can cause stomach upset--from spilling. Stagnant tree water is a breeding ground for bacteria, and your pet could end up with nausea or diarrhea should he imbibe. -- Avoid Mistletoe & Holly: Holly, when ingested, can cause pets to suffer nausea, vomiting and diarrhea. Mistletoe can cause gastrointestinal upset and cardiovascular problems. And many varieties of lilies can cause kidney failure in cats if ingested. Opt for just-as-jolly artificial plants made from silk or plastic, or choose a pet-safe bouquet. -- Tinsel-less Town: Kitties love this sparkly, light-catching "toy" that's easy to bat around and carry in their mouths. But a nibble can lead to a swallow, which can lead to an obstructed digestive tract, severe vomiting, dehydration and possible surgery. It's best to brighten your boughs with something other than tinsel. -- That Holiday Glow: Don't leave lighted candles unattended. Pets may burn themselves or cause a fire if they knock candles over. Be sure to use appropriate candle holders, placed on a stable surface. And if you leave the room, put the candle out! -- Wired Up: Keep wires, batteries and glass or plastic ornaments out of paws' reach. A wire can deliver a potentially lethal electrical shock and a punctured battery can cause burns to the mouth and esophagus, while shards of breakable ornaments can damage your pet's mouth and digestive tract. -- Skip the Sweets: By now you know not to feed your pets chocolate and anything sweetened with xylitol, but do you know the lengths to which an enterprising pet will go to chomp on something yummy? Make sure to keep your pets away from the table and unattended plates of food, and be sure to secure the lids on garbage cans. -- Leave the Leftovers: Fatty, spicy and no-no human foods, as well as bones, should not be fed to your furry friends. Pets can join the festivities in other fun ways that won't lead to costly medical bills. -- Careful with Cocktails: If your celebration includes adult holiday beverages, be sure to place your unattended alcoholic drinks where pets cannot get to them. If ingested, your pet could become weak, ill and may even go into a coma, possibly resulting in death from respiratory failure. 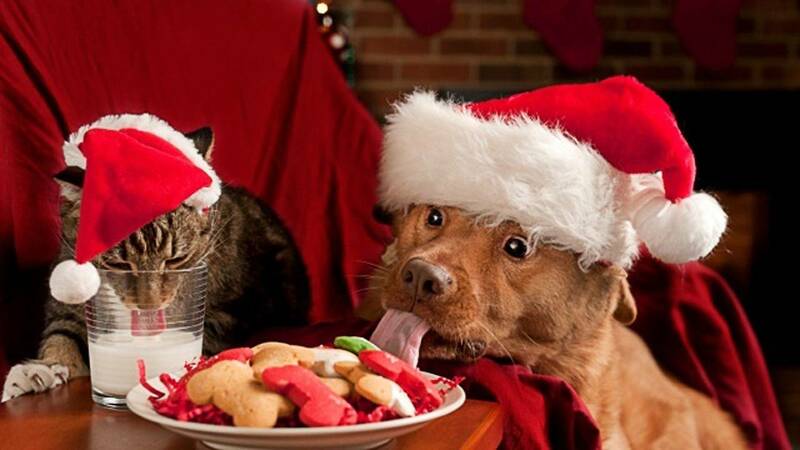 -- Selecting Special Treats: Looking to stuff your pet's stockings? Stick with chew toys that are basically indestructible, Kongs that can be stuffed with healthy foods or chew treats that are designed to be safely digestible. Long, stringy things are a feline's dream, but the most risky toys for cats involve ribbon, yarn and loose little parts that can get stuck in the intestines, often necessitating surgery. Surprise kitty with a new ball that's too big to swallow, a stuffed catnip toy or the interactive cat dancer. -- House Rules: If your animal-loving guests would like to give your pets a little extra attention and exercise while you're busy tending to the party, ask them to feel free to start a nice play or petting session. -- Put the Meds Away: Make sure all of your medications are locked behind secure doors, and be sure to tell your guests to keep their meds zipped up and packed away, too. -- A Room of Their Own: Give your pet his own quiet space to retreat to--complete with fresh water and a place to snuggle. Shy pups and cats might want to hide out under a piece of furniture, in their carrying case or in a separate room away from the hubbub. -- New Year's Noise: As you count down to the new year, please keep in mind that strings of thrown confetti can get lodged in a cat's intestines, if ingested, perhaps necessitating surgery. Noisy poppers can terrify pets and cause possible damage to sensitive ears. And remember that many pets are also scared of fireworks, so be sure to secure them in a safe, escape-proof area as midnight approaches.